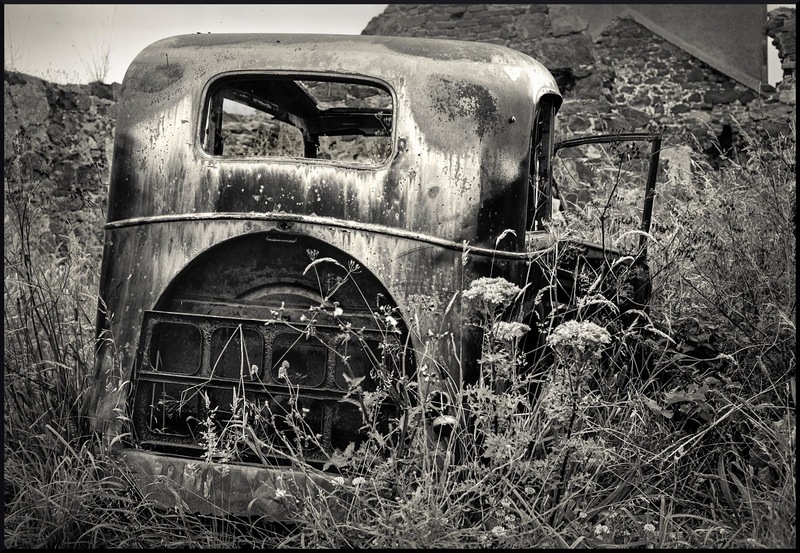 Around twenty years ago, it wasn't completely uncommon to find old cars like this from the 1940s and 1950s rusting away on farmyards or in industrial yards near my home town of Dundee. I'm not saying they were all over the place just that I wouldn't have been too surprised to have found one in this sort of state. About five miles from Carnoustie where I now live there was a yard by a roadside cottage out in the country that had about 15-20 old cars, including a Series 1 Land Rover, an old Humber, and a few other cars from the 1950s, in it. A couple of miles further on I found a clearing in a forest that had some more old vehicles including a 1940s - or possibly earlier - Citroen just rusting away. In Dundee itself, a town of around 150,000 people, there was a scrapyard behind a petrol filling station that also had lots of old classics in it. You can see a few pics I made in that scrapyard here. The star of this post, which I'm pretty sure was an Austin A10, used to sit at Fishtown of Usan, a fishing village that I've written about here. In that post I bemoaned the fact that many old places like this have been or are being "gentrified" with all signs of character obliterated in the name of progress. If you read that post, you'll see a picture of a Reliant Robin car with a signal tower behind it. Well, this Austin used to sit where the Reliant did in the pic. An Austin A10, then a Reliant Robin and then…? A Hyundai? It may be because I'm 53 and becoming a little cantankerous but I can't ever imagine wanting to take a photograph of a Hyundai, any Hyundai, in this sort of way. The lines of the A10 - and even the plastic awfulness of the Reliant - made me want to get my camera out. A Hyundai or similar wouldn't. It's perhaps just another example of the increasing way in which I tend to see modern products. I can't stand them! Yes, I can appreciate them for their efficiency but that's it. In fact, I have high hopes of getting myself a wee classic car in need of restoration, something I've long fancied doing. I won't know if it's possible for another week or so but if it comes to pass it's something I'll post about from time to time. 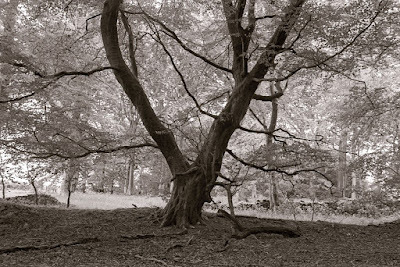 The photograph featured on this page was taken using a 90mm Sekor lens on the Mamiya Press 6x9 rangefinder. It's an HP5 negative that I scanned and processed in Lightroom. It's had a fair bit of work done to it but nothing that I couldn't duplicate in the darkroom. The sky at the top left was burned in at a lower contrast and the edges darkened in similar fashion. The staining on the rear of the car was lightened to make it stand out. Potassium Ferricyanide would accomplish much the same thing on a print. A general sweep with a Pot Ferri dampened ball of cotton wool over the plants in the foreground would brighten the lighter tones the way they are on the pic above. Finally, the spare wheel carrier recess at the rear was dodged to keep some detail in the darker shadows. I'm constantly on the look out for old cars like this just mouldering away but it's almost impossible to find them nowadays. It could be because they reached a stage where they were just beyond salvation and scrapped or the yard owners' died and their kids sold the site to a developer. Some sites, mostly over the border in England from what I can tell, do get a mention from time to time in classic car magazines but they're too far away for me. Whatever the reason for their disappearance from the rural and semi-industrial landscapes, I'm glad that I photographed them when I did as I have a collection of old negs that I'll one day make up into a photo book, a record of a time when the picturesque, the charming and the characterful were commonplace. I've got another 15 years on you, and the sentiment only gets worse with age. That might be one reason why we still like using old cameras instead of, or as well as, the new stuff. Some of my friends had these old cars when I was a young officer cadet in the 60s; they were cheap and good runners. Good photograph and story, Bruce. I'd be very interested in a post about the use of Potassium Ferricyanide if you can oblige: dilutions and pitfalls etc. I'm hoping to have the use of my local university's darkroom soon. If the visit is a success I'll have to find a darkroom with a house attached. I'll see what I can do, Mike. In return can you try to remember to post under your name. It's not a problem except that I normally delete anonymous posts and I don't want to delete one of yours by accident. Even if you have a good couple of years ahead of me, I understand your sentiment of modern engineering & machines. As mentioned in a recent post I managed to get a hand on a Focomat IIc. It clearly displays what killed off "traditional" manufacturing. There is no business in selling a machine such as the Focomat IIc - a customer will not return to you - she/he will be happy for a life-time. Thanks to ebay and other similar platforms though, it is still possible to find these classic pieces of engineering, when products were not designed to fail after a certain period of time.